With the Buffalo Bills making the AFC wild card game on Sunday, the Mariners now have the longest postseason drought in the four major professional sports played in North America. 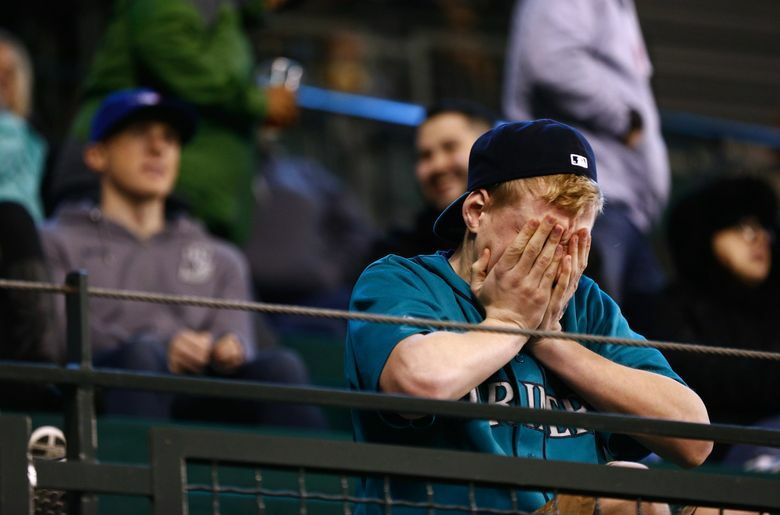 It’s a fact that every Mariners’ fan has become more than aware of over the years. They know it. They can’t forget it. Some feel it like the pain of a kick to the gut or a thumb slammed in a car door. It fills others with seething rage and bitterness, leading to demands to blow up the whole situation and fire everyone. Others shrug it off as an expected result of a flawed organization that has produced meandering plans to remedy the failure. And there are still a few who hold out hope that this is the year that it ends. The Mariners have not made the playoffs since the 2001 season where they won a MLB record 116 games and then went on to lose to the Yankees in the American League Championship Series. Over the following 16 seasons, Seattle has failed to make the playoffs. During that stretch, they have finished over .500 just six times and finished second in the AL West three times. They flirted with grabbing a second wild card spot in 2014 and 2016. But otherwise, it’s been an expected fate. When the Toronto Blue Jays returned to the postseason in 2015, snapping a 21-season drought from the playoffs, it meant that the Mariners had the longest current postseason drought in Major League Baseball. It’s a defining aspect of the franchise that simply cannot be overlooked. Still for much of the dubious streak, Seattle could feel a minuscule level of hope/satisfaction that it didn’t hold the longest streak without a playoff appearance in major professional sports — the NFL, NBA, NHL and MLB — in North America. That honor belonged to the Buffalo Bills … until Sunday when they ended their 17-season postseason drought by sneaking into the AFC wild card game. With a win over the Dolphins and a meltdown from the Ravens in a loss to the Bengals, the Bills are back in the posteason for the first time since 1999. 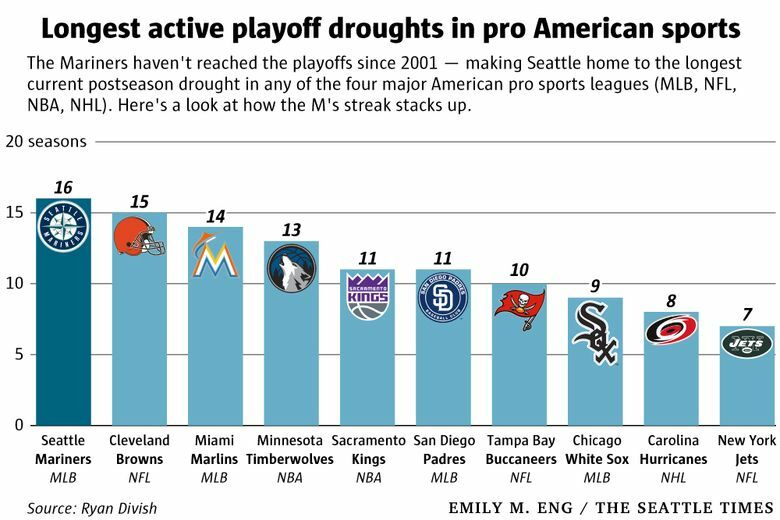 That means the Mariners now own the longest postseason drought in all the major sports. Here’s the unenviable list that Seattle sits atop of and the last time the team appeared in the postseason and length of time since the last postseason appearance. Seattle Mariners (2001), 16 seasons … With the Houston Astros — the defending World Series champions — returning all of their key pieces from last season, a vastly-improved Los Angeles Angels team and a still competitive squad in Texas, the chances of winning an American League division seem slim. The Mariners best hope to break the streak is via the AL wild card game. But with the Yankees, Astros and Indians looking like division-winning locks, it’s unlikely that 85 wins will be enough to get that second wild card spot. It’s difficult to see 88-90 wins from the projected roster unless multiple players perform better than expected. Seattle has just four postseason appearances in its franchise history. And their next appearance doesn’t seem to be looming. Cleveland Browns, (2002), 15 seasons … They’ve had just one winning season over that span (10-6 in 2007) and one other season of more than six wins (7-9 in 2014). They’ve won just four games over the last three seasons, including 1-15 last season and 0-16 this season. They’ve used 25 different quarterbacks since 2002 and recently drafted DeShone Kizer instead of Deshaun Watson … ouch. This doesn’t seem like it will be snapped any time soon despite the plan of now-fired general manager Sashi Brown to retool the roster through the draft. After winning one game in two seasons, Hue Jackson will return as head coach for the 2018 season because, why not? Do they draft another quarterback with the first pick? Miami Marlins, (2003), 14 seasons … The Marlins have made the postseason just twice since the franchise’s inception in 1993. Of course, those two appearances resulted in World Series titles in 1997 and 2003. Comparatively, the Mariners and Nationals have never appeared in the World Series. A new ownership group — fronted by Derek Jeter — bought the franchise from the loathsome Jeffrey Loria, who leveraged local residents into financing a stadium and then put the organization in financial ruin. Since taking over Jeter, has turned the Marlins into baseball’s version of a liquidation sale, trading away all-stars Giancarlo Stanton, Marcell Ozuna and Dee Gordon for less than stellar returns. What happens first: the streak is broken or Jeter returns to manage the Yankees? Minnesota Timberwolves, (2003-2004), 13 seasons … Of all the teams on this list, the Timberwolves are the most likely to snap the streak immediately. They seem to be a lock to make the NBA playoffs this season. Minnesota came into Tuesday with a 24-14 record — the fourth best record in the ultra-tough Western division. With a starting lineup that features Jimmy Butler, Andrew Wiggins, Karl-Anthony Towns, Jeff Teague, Taj Gibson and Jamal Crawford coming off the bench, they should easily finish in the top of their division this season. Sacramento Kings, (2005-2006), 11 seasons … Unlike the T’Wolves, the Kings are not going to snap their streak of futility this season or any time soon. They traded away persistent problem child Demarcus Cousins last season and their most productive player this season is 36-year-old Zach Randolph. They came into Tuesday with a 12-24 record. Willie Cauley-Stein and rookie De’Aaron Fox are nice young players, but they aren’t enough to compete in the NBA Western Conference. Remember when then-NBA commissioner David Stern finagled the situation to keep the franchise in Sacramento instead of relocating it to Seattle? New owner Vivek Ranadive has shuffled through five head coaches since 2013. San Diego Padres, (2006), 11 seasons … Perhaps it’s fitting that the Mariners’ neighbor at the Peoria Sports Complex and one-time “natural rival” per MLB interleague play is also on this list. The Padres have been in perpetual rebuild mode since 2010 when they won 90 games and failed to make the postseason. General manager A.J. Preller, San Diego’s fourth since 2006, tried to make a run in 2015, trading for Matt Kemp, Justin Upton and Wil Myers and signing pitcher James Shields to a four-year contract. The move completely backfired and set the organization back further. With the Dodgers and Giants pouring money into their payrolls, the Padres’ best hope of snapping their streak is through the NL wild card. A top heavy NL makes that almost impossible in the next few seasons. Tampa Bay Buccaneers, (2007), 10 seasons … If you watched Hard Knocks on HBO this year — and who doesn’t watch one of the best shows on television — the Bucs were portrayed as a playoff-caliber team. Led by talented, young quarterback Jameis Winston, Tampa Bay was expected to break its streak of playoff misses. Instead, they massively underachieved, finishing last in the NFC South with a 5-11 record. They had major kicking issues that started in fall camp, Winston missed three games with a knee injury and still made poor decisions when healthy that led to costly interceptions and DeSean Jackson was a non-factor at receiver. There is still talent and because it’s the NFL, they will play a last-place schedule next season, giving them a chance to break their streak. Chicago White Sox, (2008), 9 seasons … Last offseason, general manager Rick Hahn went into rebuild mode, trading all-star lefty Chris Sale and outfielder Adam Eaton for quality prospects. He then moved pitcher Jose Quintana, third baseman Todd Frazier and relievers Tommy Kahnle and David Robertson at midseason for more young talent. Chicago finished with a 67-95 record — second worst in the AL — just ahead of the Tigers. They are assembling a solid base of young talent, including top prospects Yoan Moncada, Eloy Jimenez, Michael Kopech and Luis Robert to go with Jose Abreu, Avisail Garcia, Carlos Rodon and Carson Fulmer. There’s been discussion they will make a run at Manny Machado this offseason to lead their roster. The Indians are still stacked in their division and the Twins made the wild card in 2017. But the Royals and Tigers are in decline. The White Sox might be two years away. Carolina Hurricanes, (2008-2009), 8 seasons … It’s tough not to make the postseason in hockey for this long. The NHL has had two different playoff formats during Carolina’s drought. But always a total of eight teams from each conference make the postseason. After some rebuilding seasons and playing a host of young players, they have a chance this season to end their streak. The Hurricanes are 18-13 with 43 points. They sit one point behind the New York Islanders for the final wild card spot in the Eastern Conference. It would help a franchise that consistently has worst attendance in the NHL. New York Jets, (2010), 7 seasons … They were expected to be one of the worst teams in the NFL this season and ended up being pretty bad, finishing 5-11 with only Cleveland (0-16), Houston (4-12) and Indianapolis (4-12) having worse record. Still, they were more competitive than expected thanks largely to the gutty play of QB Josh McCown. With the Patriots in the AFC East, winning a division title seems unlikely. But are they really that much different than the Bills? The Jets haven’t had a viable offense or quarterback in a long time. You could count the one-year Brett Favre experiment in 2008 and Ryan Fitzpatrick’s one decent year in 2015. They need to draft another QB. But with the No. 6 pick, they could miss out on Josh Rosen of UCLA, Sam Darnold of USC and Josh Allen of Wyoming.